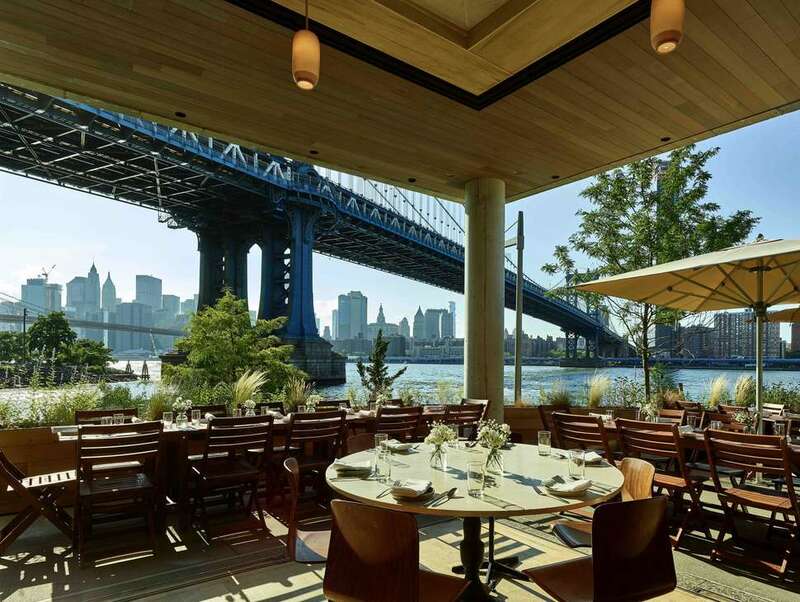 Being the most in-the-know New Yorker among your friends and acquaintances comes with a price: You are relied on to choose the destination for every birthday dinner, holiday bash, going away party, bachelor and bachelorette fête, and ‘just because’ brunch. And the embarrassment of riches of NYC restaurants does not make the task any easier. We have an abundance of venues able to accommodate parties that exceed the “automatic gratuity” headcount. But with big groups come disparate dietary needs, allergies, and tastes. So, where can you celebrate your pal’s promotion, big break, or 1,000th Instagram follower, while also honoring her pals’ lactose intolerance, keto diets, or aversion to spice/flavor of any kind? Save your headache for the eventual check time Venmo negotiations and choose from this guide to the best restaurants for groups. There’s a long held myth that Mexican food in NYC is no good -- but Chilo’s, a Mexican-inspired dive bar with a taco truck permanently parked in the backyard, has been challenging that belief for three years. Convince your boss that your department is overdue for a team-building exercise and split from work in time for happy hour, when you can get frozen margaritas for $8 and a three taco/Tecate special for $10. Heat lamps will keep you warm enough, and picnic tables provide ample space for BYO board games, should you want to authenticate the “team building” rouse. 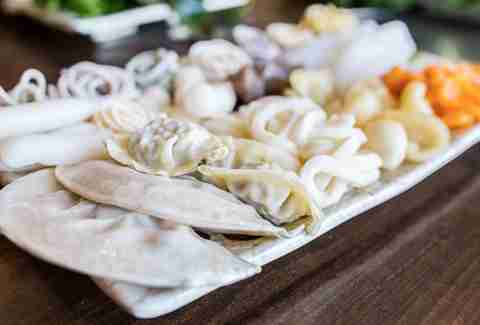 Endure the long wait at this beloved no-reservations hot pot spot and you’ll be rewarded with ample space for your group and abundant flavor combinations. Shabu-Shabu's interactive nature makes it a great ice breaking option for motley crews, and it’s pre-priced per-person, which lessens check-time awkwardness. Base prices ($13 for weekday lunch/$17 for dinner & weekends) include access to the enormous veggie, sauce and noodle buffet -- the size of which will awe the vegetarians in your squad -- but meat and seafood platters cost extra. Shepherd your out-of-town guests onto the Staten Island Ferry, take the train two stops from St. George to Stapleton, and walk five blocks for an immersive Sri Lankan experience. This nearly 25-year-old restaurant, which originally lived in Hell’s Kitchen and served a tiny 20-seat dining room, found a new home in Staten Island in 2011. The larger space allows not only for bigger group gatherings, but also for the restaurant to showcase utterly gorgeous Sri Lankan art and artifacts. Hit the wine store and the ATM in advance: Lakruwana is BYOB and the $15 per person weekend buffet is cash only. 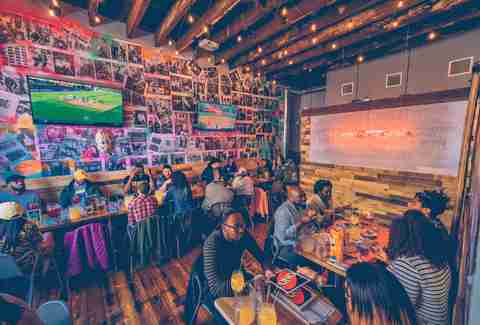 The Bronx Public’s splashy graffiti-inspired interior is a vibrant backdrop for your #squadgoals selfie and the food is easy on the eyes, too. Be prepared for a conversation stopper when your food arrives and everyone whips out their phones to document their locally inspired chopped cheese spring rolls, sharable 96-ounce Bronx Bomber mega mules, and milkshakes -- served with a rainbow sprinkle-covered chocolate rim, s’more garnish and a paper straw -- #GoEarth. Everything about this place belongs on a highlight reel: the various root beers on tap, the option to add bacon to any one of 25 beers, every single item on the “Home Cooking” section of the menu, and the take-away pickles and preserves -- which, in theory, serve as inspiration to recreate the restaurant’s comfort food magic at home. Make reservations for up to 11 people through the website; groups of 12+ are required to order from a prix fixe menu. 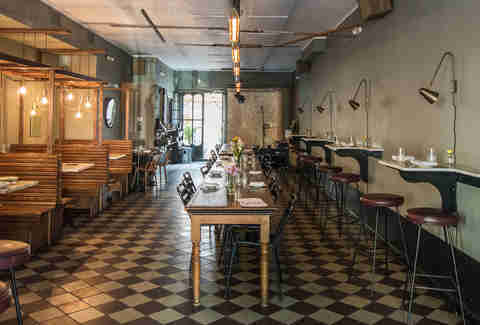 This Greenpoint gem is actually pretty small, but two long tables in the middle of the dining can easily accommodate 20 for a reasonably priced group dinner that feels like private dining without the exclusive price tag. On Monday, Tuesday, and Wednesday, options include three off-the-menu, seasonal, homemade pastas; guests on Fridays and Saturdays enjoy live music from acts like accordionist Erica Mancini and trumpeter Nico Sarbanes. 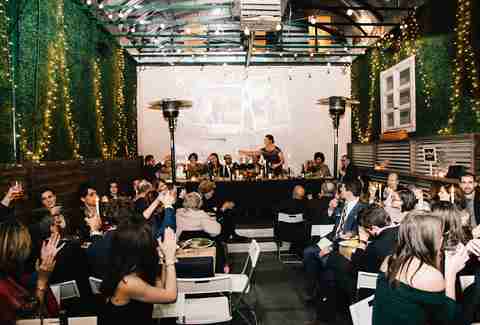 Jeepney’s Kamayan feast is a singular Manhattan dining experience. Over the course of about two hours, you and your group will nosh on over a dozen Filipino specialties laid out on a long table covered in banana leaves. And, like with Ethiopian cuisine, this is a hands-on affair. Several food and drink package options are priced per person, ranging from $45-$75 for food and $25-$55 for drinks. For a truly spectacular carnivorous meal, add on the Lechon, a 25-pound suckling pig, for $350 (recommended for groups of 8-12 people). 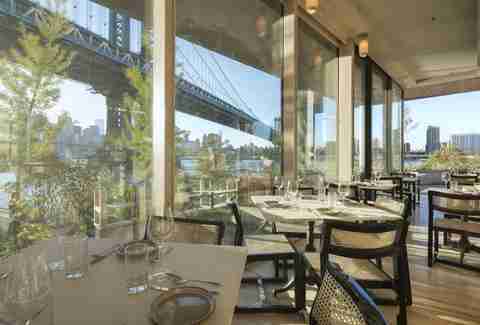 Tucked below the Manhattan Bridge, Celestine offers a breathtaking view of the city skyline. The eastern Mediterranean restaurant’s sleek and modern yet welcoming design makes it a fantastic setting for a special occasion (request the patio during the warmer months for a truly memorable celebration). The four-course, family-style meal is a steal: You’ll start with a mezze and flatbread platter, followed by a choice of two starters, two mains served with assorted sides, and a dessert platter, all for $75 per person. Looking for a spot to reunite with your old college friends? Know a lot of people with unconventional schedules? This “friendly neighborhood cocktail bar” delivers excellent food and drinks until 4 a.m., every day, along with an extensive supply of board games, a “reverse happy hour” on Mondays from midnight to close, and Movie Tuesdays in their heated backyard (find out which movies are playing each week via Instagram). And if the late-night shenanigans aren’t enticing, you can enjoy the old fashioned on draft during the day and at weekend brunch. This downtown dive is cash only, its (otherwise excellent) jukebox is half-broken half the time, and it doesn’t serve food. BUT it has a generous $5 happy hour till 8 p.m. daily, a liberal outside food policy, and a cavernous space. It’s the perfect place to connect with several friends for several hours, over several drinks, on the cheap. Pick up a dollar slice or a whole pie from nearby Champion Pizza, a perfect Al Pastor burrito from Essex Taqueria, or a fresh falafel pita from Da Falafel Guys on your way in. Victoria Marin is a contributing writer at Thrillist.